The stories Hannah Gale’s father told her of breaking wild horses in Nevada one glorious summer when he was her age have captured her imagination. After her dad is called to fight in Iraq, she regularly stops to watch the horses at the nearby stable to feel closer to him, and finally gathers the nerve to ask the owner for a job. There she helps bring a rescued mare back from the brink, takes her first riding lesson, and witnesses the birth of the filly who steals her heart. Hannah believes the worst is over when her dad returns from war, but soon she realizes her family’s fight is only just beginning. When his nightmares rock the household, it is the horses Hannah turns to for comfort. Can the horses help her teach her dad the same lessons of survival and hope they’ve taught her? Based on a patchwork of true stories, this is a heartbreaking story about the rehabilitative power of animals and the depth of the human capacity for hope. 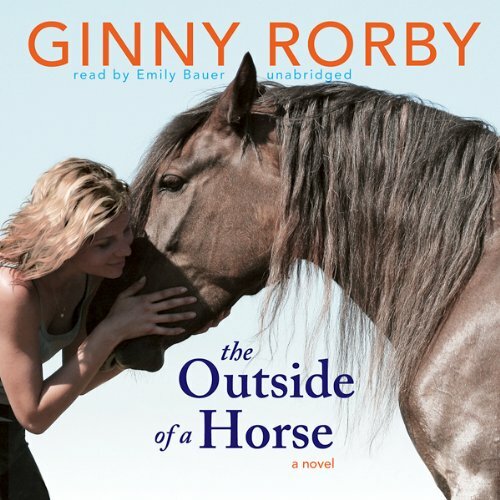 Ginny Rorby holds undergraduate degrees in biology and English from the University of Miami and an MFA in creative writing from Florida International University. Her young adult novel, Dolphin Sky, was nominated for the Keystone to Reading Book Award. She is also director of the Point Cabrillo Lightkeepers Association. She lives in Fort Bragg, California. ©2010 Ginny Rorby (P)2011 Blackstone Audio, Inc. This story gives you a perspective of a Iraq war veteran and his family and also the healing power of horses. Something for everyone, I was sad when the story ended! Absolutely. Because it exemplifies the love between an animal and ourselves. This novel makes you a believer. Reiterating the many ways how a horse can begin the journey for people, from depression, to waking each morning and being thankful for having another day to enjoy your life. Have you listened to any of Emily Bauer’s other performances before? How does this one compare? No, I've never listened to any of Emily Bauer's performances. However, I would listen to another novel narrated by her. Yes, it most certainly was. I stayed up until 5:30am and finished this novel through to the end. This novel emulates how powerful a horse can help a person to heal or be a companion for anyone. The author threads the many ways expertly, throughout the novel. The characters are well developed. The plot stays centered and does not stray. If someone does not understand how this can occur, this novel will walk you through the many ways in which horses can and do master the art of healing. The author makes you a believer in just how important a horse can become a pivotal instrument in bringing people through traumatic occurrences in their lives. Emily Bauer's novel is the best I have ever read in this genre. I encourage anyone to read this novel. However, the novel is very emotional in many parts and you will need to have some tissues for the many tears that you will shed. Crying is also a healer for all of us. Seriously upset with myself for buying this book before Googling it. Really wish I would have seen the Amazon description that this book is intended for 10 year olds. (Why reading level isn't stated on Audible descriptions is beyond me) I would have loved this book at age 10, but not as an adult. I tried so hard to finish it and get my money's worth but it's written so simplistic and the reader does such a good job of mimicking a child's voice it's just too much for me to finish. Young adults.. although the emotional soap box rants of the author make me nervous..
Did Emily Bauer do a good job differentiating all the characters? How? Good understanding of horse crazy young girl. Opinions are very strong and un-substaniated.. careful how you present, it may turn people away from the point of the book and dismiss as opinionated. You are trying to appeal to too many causes. Disapointing book.. good idea! What did you love best about The Outside of a Horse? The perspective of the little girl telling the story - interesting to see the world from her point of view. The main character, Hannah, she was sweet and very hopeful. Seemed realistic for a girl of her age. Cool to have the story told by her. When Hannah talks her way into a job at the stable. I think so, yes, a few times. A heartwarming book. Makes you think again about making the best of difficult situations.